Dan : As some of you may have already read in a different post, I started to repair an H942 that was in desperate need of it (check the Kamikazie section listing). Well, I am switching gears here. I got as far as re-gluing the braces, and a failed attempt at gluing the top back on. I decided that since I already have an H942 that I had already restored, I was going to customize this one. This H942 will receive X-bracing, and a slimmer neck. I love the neck on my Martin Dreadnought, so this one will get it's neck shaved down to the dimensions similar to my Martin. Seeing as how I also have Carpel Tunnel now, playing a Harmony neck really hurts and numbs my hands, so that was another reason for my decision. Also, I may get fancy pants with this one and rout out for some actual real binding, but we'll see if I feel like spending the money on the bits and bearings first. I'll figure that out when the time comes. 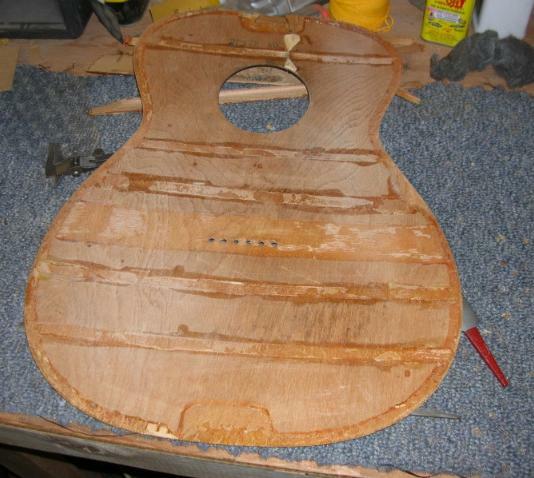 Well, the weekend before last, I (re)started this project by prying the top back off of the guitar. A little harder to do seeing as it had fresh hide glue on it, but I got it off nonetheless. Than, I started working on getting the braces off, but had to stop as the nice sharp spatula slipped through the brace and into the side of my hand, being stopped by the bone. This past weekend, however, I got the remaining braces and bridge plate (and overlay) off. I am back to just a thin piece of wood that resembles a guitar. I also decided to round off the back braces. Probably no reason for it, but I decided that since it was already off, it couldn't hurt anything. I removed all the frets from the fretboard since I would like some that are a little wider like the modern guitars have. I then drilled out the headstock to accept the modern Gotoh style tuning machines. Once I did that, I bolted the headstock directly to my work bench and started to file down the neck. 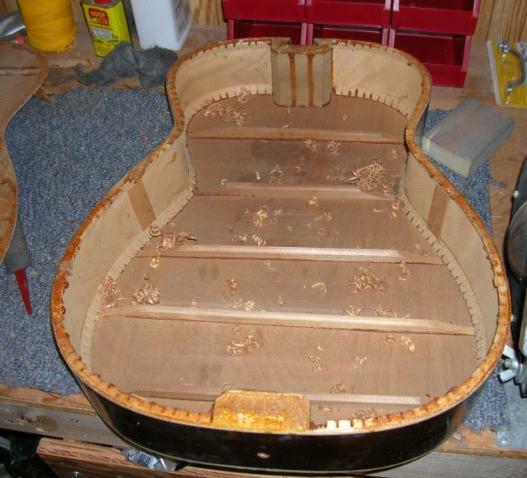 The first rasp that touched the guitar made very fast work of the finish, and the rest went to town. Here's my army of rasps. Fanfab4 : Dan great job so far . That is except for the spatula mishap . Getting a little ahead but does the old glue have to be removed from the top and the kerfing on the bottom before regluing ? And how is that done ? Dan : For cleaning off the old glue, I am just taking a stiff, but sharp spatula to scrape the old glue away. I don't see any other way to do it. I will defiantly try to take more and better pictures as this project progresses. When I glue in the braces, I will be using my go-deck with my go-bars for this process. You can build your own like I did for around $30. 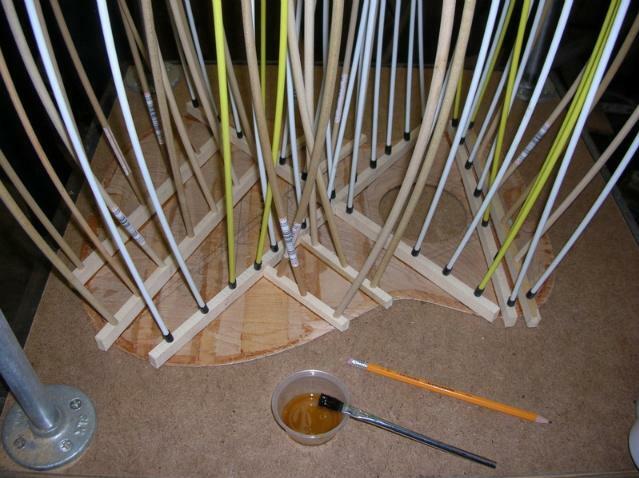 Plus, you can purchase 1/4" hard wood dowels for the go-bars, which I did at first, but I ordered some real go-bars since they flex easier and return to their normal shape much faster. Well, I hope to have some shop time tomorrow to continue working on the H942, but in the meantime, while playing my Martin tonight, I was thinking about the string spacing. Do I want it to be similar to my Martin, or should I keep it as wide as the typical Harmony? 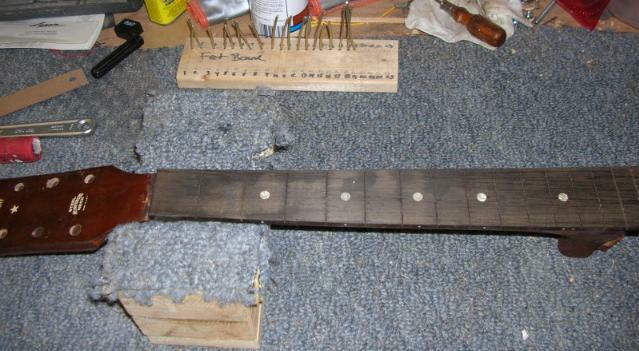 Once the neck is thinned out, will making the fretboard narrow really be necessary? I haven't quite figured it out yet. This guitar is going to receive a new bridge seeing as the one I took off of it was an adjustable bridge, and I just hate adjustable bridges. It's something I will need to ponder on by tomorrow as I plan to do a lot of work to the neck. I may just go a bit narrower like the Martin, but it's something I need to think about since there is no turning back once I start. 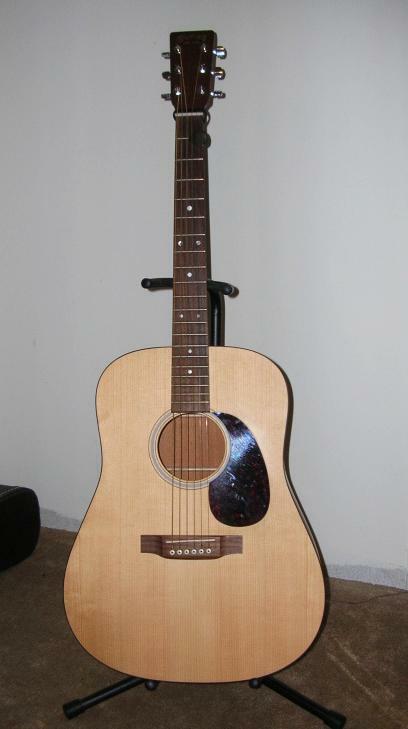 Oh, and by the way, the guitar that I am copying is my Martin DSM. The neck on this guitar is just perfect. I don't feel the fatigue like I do when playing the Harmony. 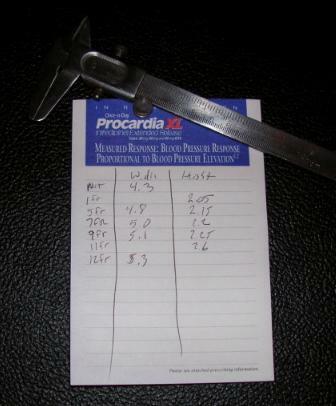 Oh, and here are the measurements I took of the Martin neck. Well, I got some shop time in today. I focused mainly on the neck. 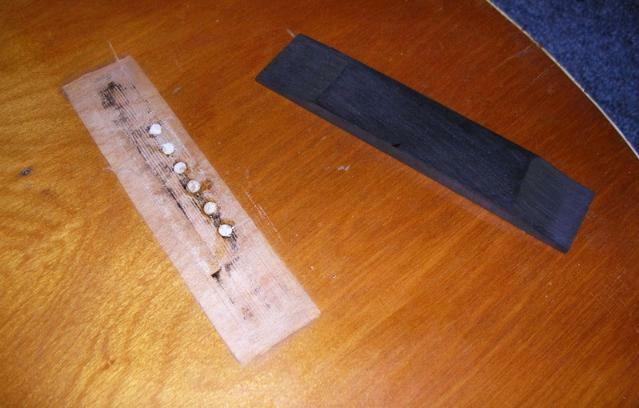 I first, for some reason, sanded down the fretboard. There were divots in the fretboard, so I scored the area and mixed up come ebony dust and cyno. glue. Once dry, I sanded it down. You can see the area in this picture, and it may not be perfect after it is all said and done, but with frets and strings on it, I don't think it will be too bad. I used my Craftsman plane with the blade removed to keep my sanding flat. Also, this being a flat fretboard, this really made my life easier. I then bolted the neck back to my workbench and grabbed my army of rasps and files, and sandpaper, and went to town until I got the thickness and width down to that of my Martin. Once I got that done, I sanded off all of the old finish. You will see that there is a bit more sanding that I need to do, but I didn't notice it too much myself until I saw these pictures. I decided not to do a peghead overlay, and just leave it as is. I have to let it keep it's identifier that this is the original, but customized neck. 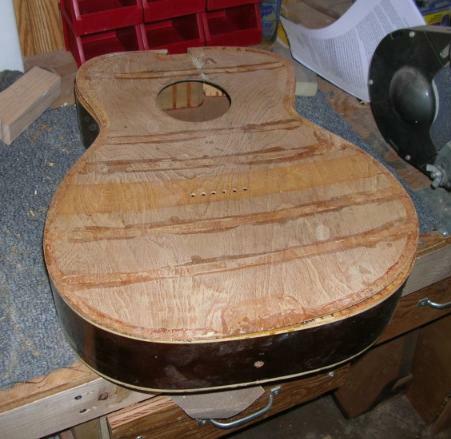 As for the finish on the neck, I know that usually, the naked wood would get a coat or two of shellac, than a died lacquer would be applied, and once the desired color is done, than a few coats of clear lacquer would finish it off. well, I don't have the money at this point to spend on all the dyes and whatnot, and it would be a little cold here (Chicago) to paint outside with the compressor running. Needless to say, I can't quite bring the compressor indoors in a makeshift spray booth, so what I think I am going to do, since this guitar is custom anyhow, and if it were worth anything, probably wont be now, I may have my sister (the stain master) stain it as close to the original color as she can, and I can just lacquer over that. My sister has an eye for getting colors to match with stains. I don't know how she does it, but she does, so I'll be asking her to do this for me. Once I got the neck about where it should be, I turned my attention to the top. I chiseled down the cleats just so that they aren't in my way. I than scrapped the excess glue and other residue off, and lightly sanded it down. I kind of sanded down some of the original serial number ink, but I know what it is. The top still looks messy with all the glue stains and whatnot, but then, nobody will be looking at it. The main thing here is X-bracing. Well, I got more done on the neck of this guitar. My sister, the "Stain Master," got the neck color to resemble the rest of it as close as she could. I think she did a pretty good job, thought you can still tell that it isn't original. Unfortunately, I didn't get all of the original finish off, so you can see some areas that didn't absorb the stain. It's going to be somewhat covered with tuning machines anyhow, and not going to be seem from the front, so I'm not letting that bother me. I was able to get some shop time in today, despite needing to install new brakes on my car, and having another guitar I needed to get out of the shop. Today, I focused on the bracing. this is the first time for me to brace a guitar from scratch. I scored some rather tight grained spruce from a hardware store. 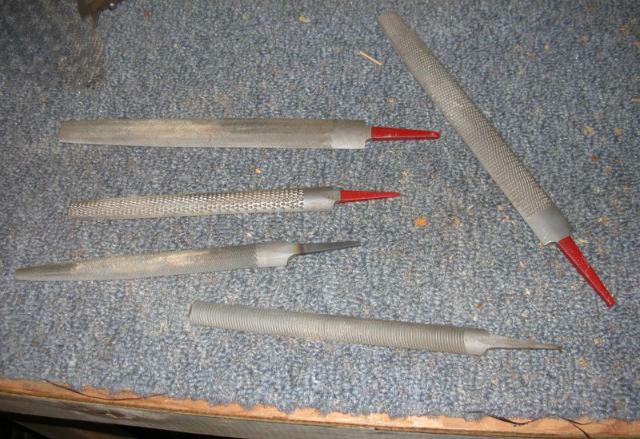 I found some pieces of spruce, and after going through a whole bunch of it for straight and tight grain, and tapping it to see if it had a good sound, I found a few pieces that I felt would work out well after cutting the pieces down to bracing sizes, and getting rid of the material that had knots and whatnot. Anyhow, I was able to get a lot of usable material for about $5. I then was able to find a bracing template on the internet after a ton of looking and editing, once I found it, to make it work with my guitar. I transferred the pattern to my guitar's top. I don't know how well you can see it in this picture, but the pattern is there, with one mistake that you can kind of see that I crossed out. 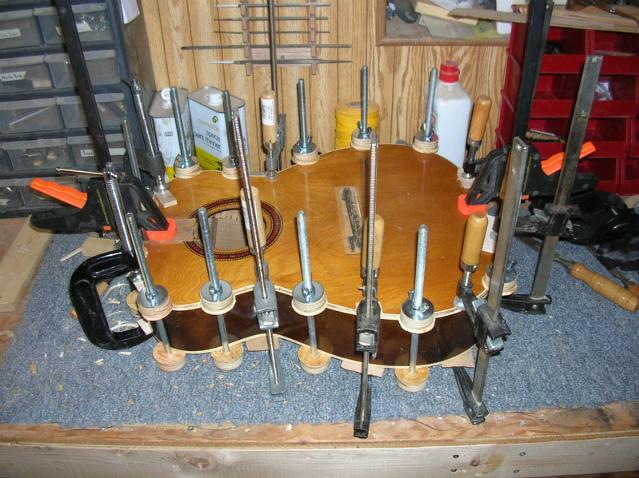 I then placed the top on my go-bar deck, and started to glue the pieces, once by one, to the top of the guitar. I used liquid hide glue from Tite-bond. It works quite well, though I feel you need to wait more than 24 hours for it to be completely dry. Quite frankly, I think it needs three days. I didn't use hot hide glue because I wanted the extra time to work with these braces. Anyhow, one by one, the braces were glued in and clamped down with the go bars, both the graphite ones, and the wooden dowels. With all of them used up, I didn't have enough to get the three small sound hole braces in, or the bridge plate glued up, so they will have to wait until the next time I get to the shop, which my be on Wednesday since my job is letting us out a couple of hours early. That should be enough time to get everything else clamped up. I still haven't decided whether I will use real binding on this or not. It will all depend on my money situation by the time I get around to that. The bit with bearing will be around $80, I think, and I just don't know if it is something I will ever use again, though I do plan to build a guitar from scratch, but that will be way in the future. I still also need to carve a new bridge for this guitar. Originally, this one came with an adjustable bridge, and I hate those things. 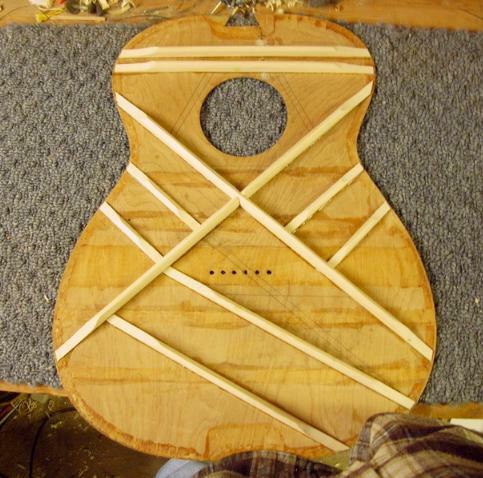 Also, the string spacing is going to be different, more like my Martin, so I'd have to carve out a new bridge anyhow. After that, I need to make sure the neck angle is where it needs to be, and once the guitar is together, I need to sand and crown the frets. I can't wait until this guitar is playable again. I am really curious to hear how it sounds with the new X-bracing. I'll need to figure out how to record some sound clips to share it with you all. 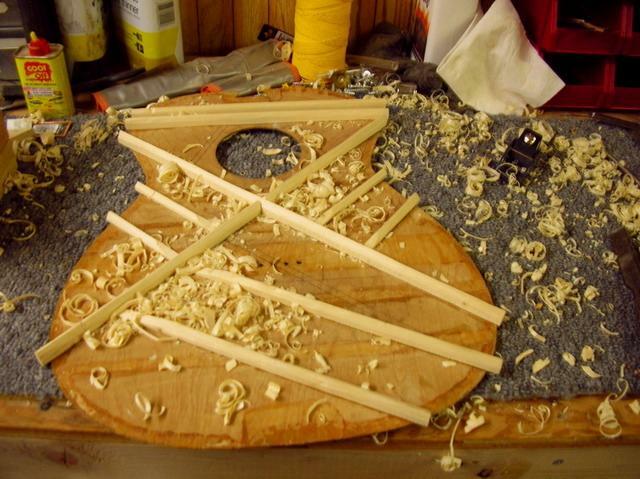 Last weekend, I had a chance to carve out the braces on the guitar. A few (well, more than a few) swipes with a finger plane and assorted chisels, and cleaned up with a dremmel and hand sanding, I had the braces looking decent, and removed a lot of material. 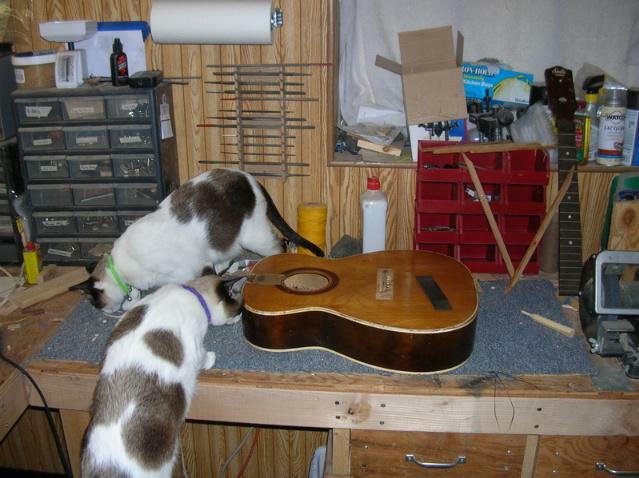 I still had to glue in the soundhole reinforcements and the cleats for the crack under the fingerboard just to make sure the crack would be stable. I also glued in the maple bridge plate. So, that all went back onto the go-deck for clamping. No, the reinforcements aren't really that tall, they are rather shallow. I just used some scraps to clamp them in since the go-bars were just making contact with them, so I wasn't getting much clamping pressure from them. Same with the bridge plate. That's all I got done, but shaping the braces took a lot of that time. I still have the chance to scallop the braces, but not sure if I am going to do that yet. I may view some pictures of scalloped bracing and make my decision from that. I am going to be working on carving the new bridge first though as that needs to get done anyhow. 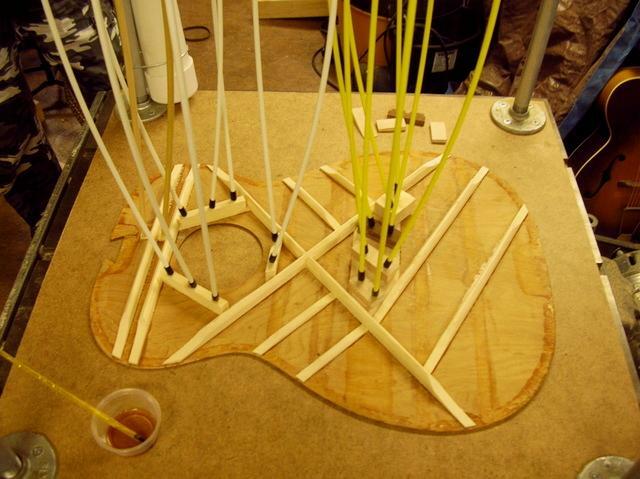 I was also recently toying with making this guitar an electric acoustic. I can get a rather decent under-the-saddle pick-up system. I just need to decide if I really want to cut a large square hole in the side of this guitar or not. I mean, to a collector, this guitar is worth nothing now, so I guess it wouldn't hurt. I'll be making my decision soon as I will want to do this before I glue the top back on anyhow. I still haven't decided whether or not to bind this thing yet either. So many decisions. Also, I may not get much shop time in for a couple of weeks as I have a music event coming up at the church I attend rather soon, so I've been devoting some extra time to that recently, and will need to devote a bit more for the next couple of weeks. 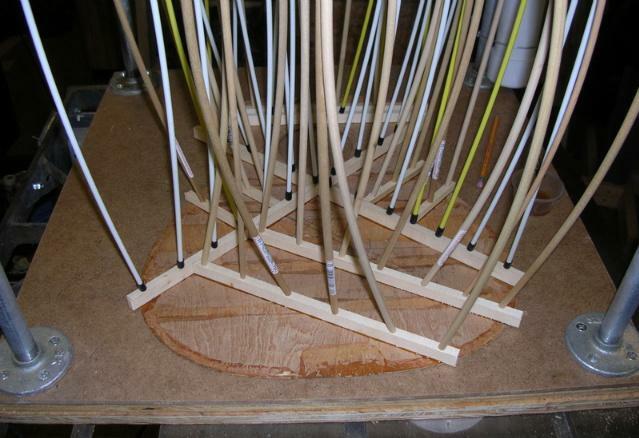 Dan : I really do not have any use for making it an electric acoustic. I recently purchased an electric acoustic guitar recently that I repaired, and really enjoy playing it through an acoustic amp. I just figured that if I wanted to go that route that I would want an under the saddle pickup with all the electronics built in, which would be a lot easier to install with the top off. I guess there really is no other reason to do it other than to have the only Stella flat top guitar with built-in electronics. I may just save the money and not do it. It's just something I was toying around with. Dan : Well, I know I said I'd be gone a week or two, but that has turned into over a month. Just really busy lately. Anyhow, I was finally able to get back into the shop this afternoon, and was able to get some work done on the H942. Today, I worked on scalloping the lower braces. Not too aggressively, but I wanted to get some more material off to allow the top to vibrate some more. Than, I notched out the the perfling to allow clearance for the new braces. I was in a zone, so I failed to snap a picture of that process. 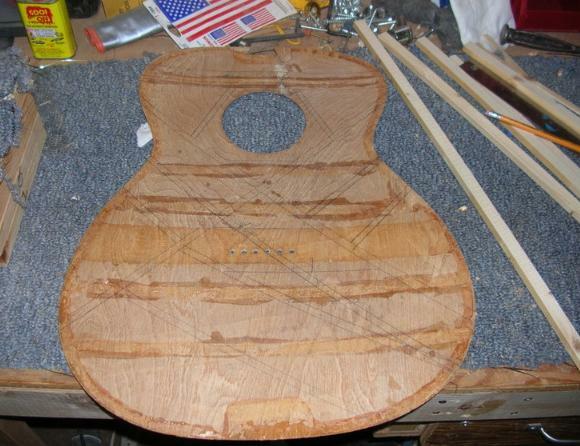 Anyhow, I finally got to gluing the top onto the guitar. Here's a shot of the forest of clamps. That will be drying until at least next week. Unfortunately, the top shrunk a bit, which I had a feeling was going to happen with all the warping and cracking that had happened. I will have to think of a way to make up for it. I think I probably will have to break down and invest into actually binding the top of this guitar. 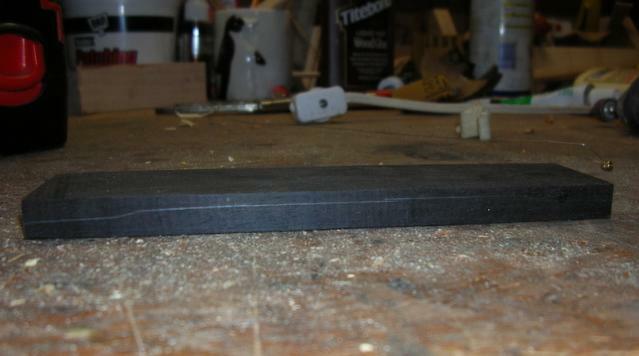 Well, while that was drying, I cut down and sanded a piece of ebony for the bridge. I have it at the correct length and width of it now, but need to shape the top of it. I still need to figure out how to do this with the tools and machinery I currently have. I think it may be time to invest in a 1" X 48" belt sander to get this done, but it will have to wait due to lack of money. Oh well. I will keep you all updated of the progress. Sea Champ : New bridge, this is a nervy project. It sure is the obvious route to grind the shape of the bridge on a belt sander. But don't overlook carving ebony with a sharp chisel or knife and finishing with a file. It's really different wood, more like soft stone. Dan : Okay, I got some shop time in this past Sunday. 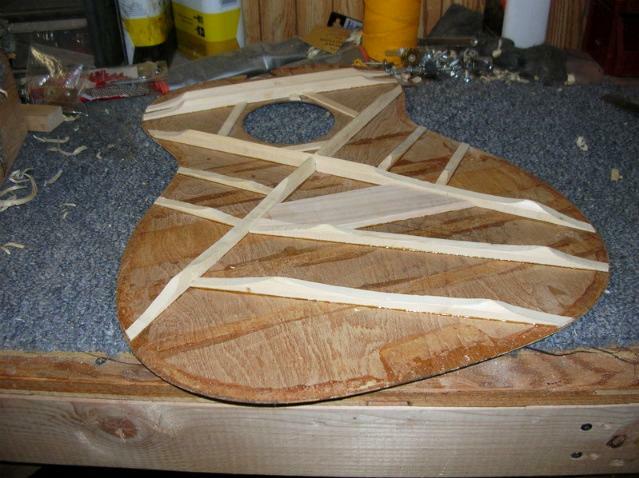 I took the clamps off of the guitar body, and it went together nicely, even thoug there was some shrinkage to the top. My two shop assistants felt this went well as all. I still need to figure out the route I need to go. Do I bind it and risk badly chipping up the already slightly brittle finish, or do I fill it in somehow, and just repaint the binding? I still need to figure it out. I got the bridge all carved out as well. I just rough cut the the shape of the bridge with my band saw, and used the sander for the rest. It went easier than I expected it would, being a piece of ebony and all. Also, I turned a piece of spruce on my lathe and used it to fill in the holes under the bridge since I will be using Martin spacing. The holes were filled after I scraped the bridge area of all finish to make sure I get a good gluing area for the new bridge. Also, I did dry-fit the neck on the guitar with the bridge on it, and it looks like the neck is going to be a great fit. No need to carve it down as I would need to do on a reset. This was all I got done. Unfortunately, I have a lot of practicing to do for a few gigs I have coming up, so I am not sure how much I will be able to get done on this guitar, but then, I don't have too much more to do on it. Once the bridge and neck are glued on, I just need to figure out how to route out the saddle area for the bridge, re-drill holes, and I will basically be done with the guitar, minus some touching up and setting up.